How they could know their attire? They are long-time friends and business partners since 2013 in Casamigos Tequila. 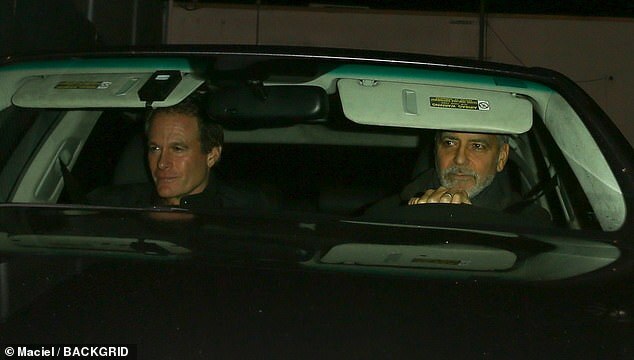 And George Clooney and Rande Gerber were in good spirits as they enjoyed a boys dinner date at Craig's Restaurant in Los Angeles on Thursday. 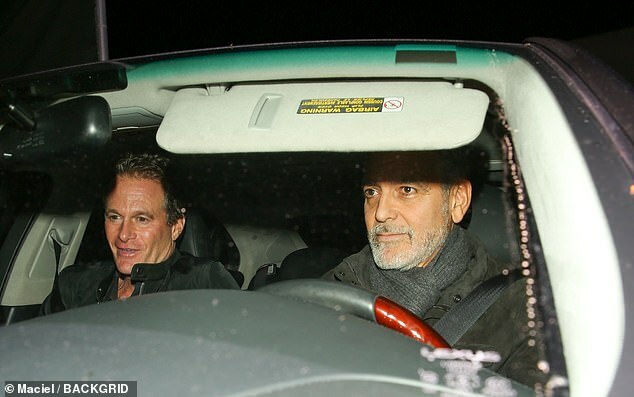 The actor, 57, and his businessman BFF, 56, who is married to supermodel Cindy Crawford, looked happy and relaxed as they left the celeb hotspot after a four-hour dinner, with George taking the wheel to drive the pair home. Syriana star George looked handsome in a khaki green jacket and jeans, paired with a slate grey scarf as the pair drove away. He sported a distinguished salt and pepper beard and moustache. Mogul and former model Rande showed off his hunky physique in a black shirt, jacket and jeans, with his brunette locks styled in a quiff. Rande has been married to Cindy, 52, since 1998, and the couple share model children Presley, 19, and Kaia, 17. While George has been happily wed to human rights lawyer Amal, 40, since 2014. The couple share twins Alexander and Ella, one. George and Rande decided to sell their stake in the firm in 2017 to the alcoholic beverage company Diageo, which agreed to pay $700 million to assume control of the brand, with the potential for another $300 million based on its performance over the next decade. In a statement, George - who founded the firm alongside his partners Rande and Michael Meldman in 2013 - said: 'If you asked us four years ago if we had a billion dollar company, I don't think we would have said yes. I wonder if they're all there, or if he's there on his own. The way he and others are dressed out there looks more like NYC than LA, so maybe Amal and the kids are someplace warmer. It's nice to see him again! I don’t get it what was the Lainy piece meant to be about? George is always talking about how much he loves the movie industry and he does a lot to support it. I'm thinking he might show up at the Oscars if they asked him. As far as the drinking goes, now that he's a happily married father of two maybe he doesn't need to drink as much as he used to. Maybe whatever emptiness he had in his life has been filled. I agree with you Lizzy , he may also be taking safety more seriously I'm sure that accident was wake up call. I think he wants to see his children grown and have more time with Amal. So a big name in the industry at large who has no nominations and nothing to lose or gain might be the answer - if he's there and is willing to do it of course! I think it's possible George Clooney could appear at the Oscars this year. 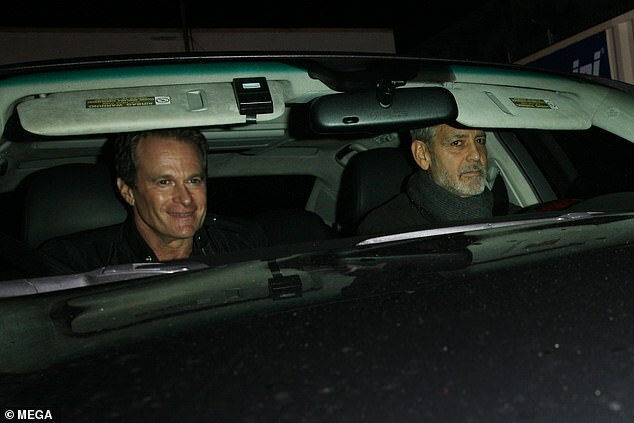 George Timothy Clooney (born May 6, 1961) is an American actor, filmmaker and businessman. He is the recipient of three Golden Globe Awards and two Academy Awards, one for acting in Syriana (2006) and the other for co-producing Argo (2012). In 2018, he was the recipient of the AFI Live Achievement Award, at the age of 57.
it's me wrote: But why?? It's me- If they ask him to help out, why not? He really has nothing to lose and it can't hurt to get his face out there once in a while for something other than the tabloids. I, for one, would love to see a little of the old George again. It's me - The Oscars are a mess at the moment:there is no host. Kevin Hart had been chosen but had to me dropped because of homophobic comments. What better to replace him with than a virtual Ambassador of Hollywood with huge connections to every part of the industry, charm, turn of phrase and never puts a foot wrong. Just one problem: he hates the whole thing and may not be in the States anyway! Wait your turn, It's me! All of COH will be in that line. Actually, he doesn't have to be "the host". He could be one of several people hosting. If he signs on, maybe others will think, "If George is doing it I will, too.". Not too sure it will happen but it would be fun if it did. Thanks pan for the pictures ! I like his expression in picture two. LOL. a scarfed tucked in ? "designated driver" for the evening. Seems like he's been going to Craig's fairly often lately. I wonder if it's his way of reminding people that he's still around, since the paps are always there to snap him coming and going.